By default, the Orders Pane and Fills Pane sort by the Order Time field. However, a property on the Orders tab in the Properties menu called Move Filled orders to the top could alter this order. In addition, you can define the sort order by column and up to three levels in ascending or descending order. 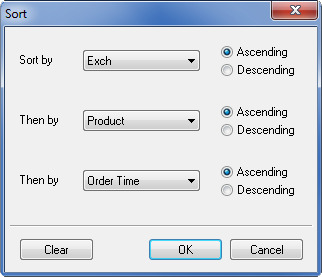 Right-click inside the Orders Pane or Orders and Fills Pane to display the context menu. The Sort dialog box displays. In the Sort by field, click the first field to sort by. Click whether to sort this field in Ascending or Descending order. If you want to use another field to further sort, repeat steps 3 and 4 using the Then by fields.